Becoming a successful online retailer is not so easy at first. But, once you get accustomed on perfoming the tweaks for your business, runing effective campaigns, and selling through multiple channels, then it can be your main stream for cash inflow. So, selling products through effective marketplaces like eBay is something you don’t want to miss. Looking for specific reasons, why? Here are the 5 top benefits of selling on ebay. eBay serves the customers globally. This presents retail sellers to list their products targeted towards multiple nationalities. You may be selling from UK while your target customers are average or business people in India. But that’s not it. eBay also solves the shipping problem of the global sellers. Running your own eCommerce business? 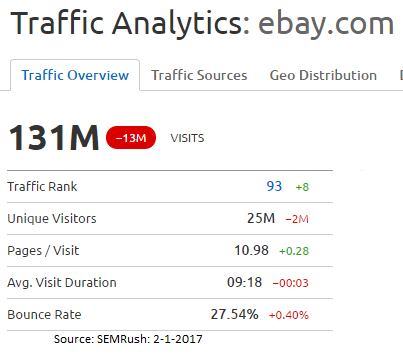 Have you tried to rank on the keywords that eBay ranks for? It’s tough. Why not list your products on eBay and grab their SEO benefit for your products. When you have a bulk stock of products, you can always use the fixed price listing. But what if your stock is limited and demand is high. That’s when you benefit a lot from the auction listing while selling on eBay. Though rumours fly around, there are many people who prefer to purchase from eBay while compared to the other merchant sites. Like every popular sites, there are many loyal customers who prefer to purchase on eBay. Customers may prefer to purchase from merchants like these than a site that they land on the first time. Compared to other merchants, eBay charges lower fees for prodcut listing. Though it charges a final fee (a sales commission after sales), that is also low and it depends upon the total amount of sales. eBay also offers affiliate programs through multiple affiliate marketers will take your product link and promote your products in order to receive the affiliate commission. This will help to increase your sales. So in addition to running your affiliate program, you can also benefit from the eBay affiliates. How to start selling on eBay? Select the payment plan: Paypal is more commonly used but you can select Money Order, Personal Cheque, Pay on Pick up or Others. Select your shipping policy: Here provide information such as policy name, policy description etc. If you want to apply same shipping rates to all buyers, you can select the Flat shipping. Please feel free to add information to this post by providing your comments. We’ll add specific tips to list your products on eBay to increase audience.